Oceany, hints of sweetness with a soft velvet texture. Dulse is a healthy and tasty ingredient in a wide range of foods. Add it as a vegetable/meat alternative to fish dishes, curries, stews, soups, bread, chowders and salads. It can be eaten straight from the ocean and when dried it makes an excellent on-the-move snack. Or, try deep-frying it for a few seconds. Seriously better than potato crisps! 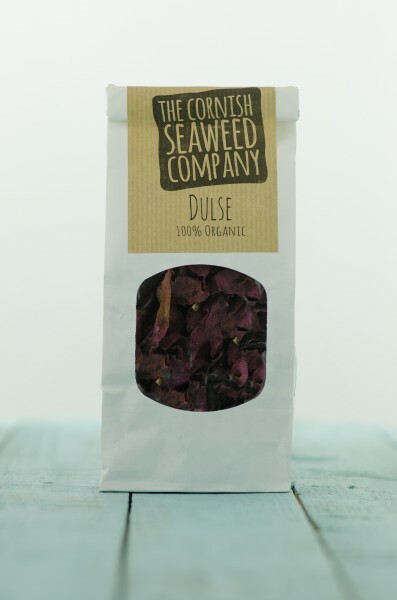 The Cornish Seaweed Company sustainably harvest a variety of Cornish seaweeds using traditional means to be used as a Superfood or artisanal ingredient. If you enjoy the feel of the sand between your toes, wavelets slapping at your ankles, big deep breaths of the seaside and consider what you nourish your mind and body with to be important, we would like to bet that you’d find seaweed pretty good stuff!